If you know of any senior citizens in the Bagley Community who had severe water damage from the flood rains on Monday August 11th, please call the Bagley hotline at (313) 927-2674 or email Bagleycommunitycouncil@yahoo.com. Leave your name, address, damage description, and a contact number. If you are not a senior citizen and your house or business has been damaged from the rains on Monday August 11th, please call the hotline, or email as well. The information will be given to the Department Of Neighborhoods District 2 manager Kim Tandy. The City needs to know this information so it can give it to the State Of Michigan. There is an organization by the name of All Hands Volunteer that is here to help residents that are in need of assistance from the our recent storm. The organization is in need of volunteers and well as offering some assistance. Please read flyer and pass on to as many people or organizations as you can. Click here to download flyer. Bulk pickup for Detroit residents is continuing daily in the aftermath of last week’s flooding and citizens are being asked to leave their items at the curb until the City’s trash collection contractors or DPW crews can pick it up. Due to the large volumes of water-damaged bulk items that continue to be set out after last week’s flooding, the City contractors are running 1-2 days behind schedule in picking up bulk items. In the meantime, a Department of Public Works team of more than 30 workers has been dedicated to providing additional bulk pickup. DPW Director Ron Brundidge also issued a reminder that residents should leave their bulk items at the curb until collected and will not be ticketed. In addition, Detroit residents, whose bulk collection day has passed, may call the City to request a special pickup. Residents should call (313) 224-3901 to notify DPW that they will be taking flood-damaged items to the curb. “On Monday, August 11, 2014, the City of Detroit was hit with a series of storms that dumped the most rain it has seen in a single day in 89 years. This unexpectedly heavy rainfall has caused damage to homes and businesses. Portions of local freeways and surface streets became impassable. In anticipation of today’s additional rain, the Detroit Water and Sewerage Department (DWSD), in a coordinated effort with the Department of Public Works (DPW), has crews working across the city to identify roads and streets that are still flooded and need to be cleared of water. If residents are able to locate their catch basin and remove any visible debris, this may alleviate the flooding in front of their home. If it does not, they can call DWSD at 313-267-8000 during the day and 313-267-7401 after hours and the city will send out a crew to clear the obstruction. Despite the extraordinarily heavy downpour, DWSD’s operational systems suffered no failures and by design excess water was discharged into the Detroit River as rapidly as possible in an effort to prevent flooding. Unfortunately, the volume of rain—over five inches in some areas—overwhelmed sewer systems, causing widespread flooding. As of Tuesday morning, August 12, water levels were subsiding and most road flooding had receded. Many thanks go out to the first responders—including fire department and EMS workers—who attended to those in distress, in some cases pulling stranded motorists from their vehicles and getting them to safety. The city’s DPW will conduct a special bulk pickup to remove damaged items that residents take out to their curb. The city will not issue any citations for storm damaged debris left at the curb for several days until crews can remove it. Residents can contact the DPW at 313-224-3901 to notify them they will be taking flood damaged items to the curb before their normal pick up day. City officials noted that flooding of this type also presents health concerns and risks. City residents who experienced basement flooding are advised to contact local restoration services to dry and disinfect their belongings. If your skin has come into contact with sewer water, be sure to wash thoroughly with anti-bacterial soap immediately afterward. Residents are urged to use extreme caution around standing water in the event it has come into contact with an electrical source. Do not turn on appliances in flooded rooms until they have completely dried out. The City’s home page has a link Flood Damage Information that provides a link to the online form for Flood damage assessment. For people who need volunteer assistance to clean up, United Way (211) will transfer callers to the State’s Recovery assistance program and they will take their info—volunteer clean-up help only—no financial help. DHS is possible source for financial help for low income families in need. Ombudsman is helping people fill out form. They have a slightly different online form they use for damage assessment. Residents can call DPW at 313-224-3901 and give there addresses for the flood pick up. Here is important information on re-entering your flooded home. The Office of Mayor Mike Duggan has been coordinating with various city departments to prepare for the effects of possible severe weather this afternoon. Potential issues could include power outages, flooding and downed trees. To report a downed tree, go online at www.detroitmi.gov or call the Ombudsman’s Office at 313-224-6000. For after hour calls, please contact the Forestry Division’s after hours hotline at 313-590-3336. If the tree is between the sidewalk and the house or in a backyard, it is on private property and is the responsibility of the homeowner, who should contact their insurance company or a private contractor. If the tree fell from private property but is blocking the street, residents should still call the city at 313-590-3336. Removal of tree limbs: If a homeowner has taken it upon themselves to cut up a fallen tree or limbs on their property, they should cut the debris into sections no longer than 48 inches and leave it at the curb for their next scheduled yard waste collection date. If your street is experiencing flooding on surface roads, first try to clear any debris from storm drain covers if you can do so safely. If you unable to access a blocked storm drain, or if clearing it does not work, please contact the Ombudsman’s office at 313-224-6000 and a crew from the Department of Water & Sewarage will send out a crew to clear the debris and/or clear out any obstructions in the line that may be preventing water from draining. If a fallen tree or limb has impacted a power line, stay away and call DTE Energy’s emergency line immediately at 800-477-4747. The U.S. Department of Homeland Security’s Federal Emergency Management Agency will open a third location at the northwest campus of Wayne County Community College District to assist Detroit residents and businesses in registering for federal aid. 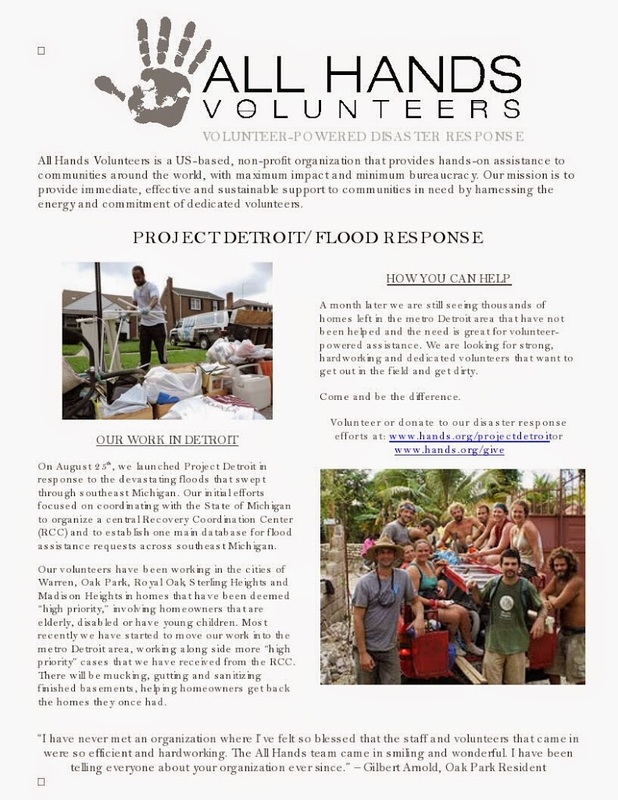 Last week, the U.S. government announced that disaster aid is available to Michigan residents and businesses affected by flooding on August 11-13, 2014. Detroit residents must register with FEMA to apply for assistance. Calls previously made to the City of Detroit Homeland Security & Emergency Management, the Ombudsman’s Office, and United Way do not qualify as registering with FEMA. Call FEMA at 1-800-621-3362. The number also may be used for 711 or VRS. Hearing or speech impaired applicants should call 1-800-462-7585. Both numbers are operational 7 a.m. – 11 p.m. (EST), seven days a week. Thanks for sharing such a useful information. It is very useful and informative. Is cleanup pros a good business?